Doctor’s Day is around the corner! 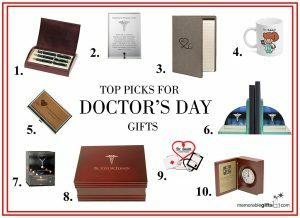 Don’t fret, here are our Top Doctor’s Day Gift Picks for the doctors and healthcare professionals in your life. These gifts are great for existing doctors and even new doctors and nurse just about to graduate! New unique designs and items, there is something for everyone on your list! 1. Personalized Pen Set – The classic gift for any professional is a personalized pen set. Adorn your doctors desk with this special pen, pencil and box set. Personalize this set with their name, title or hospital, this gift is sure to be displayed with pride for years to come! 2. Thank You Plaque – When was the last time you thanked your doctor? Whether it is for great regular healthcare or for saving your life – doctors work hard to keep us healthy. Thank your doctor with this engraved plaque with a special message of thanks. 3. Personalized Portfolio – Help keep your doctor organized with unique portfolio! In different shapes, sizes and styles this makes a great gift for all doctors. This makes a great gift for the recent graduate and helps them keep all of their notes and paperwork in a safe place! 4. Exclusive Custom Character Mug – This exclusive custom character mug makes a great gift with some of their favorite coffee or tea! Customize the character to make it look just like your doctor for a sweet and funny gift! 5. Business Card Holder – The perfect gift for the doctor who is always meeting new doctors at conventions to stylishly and professionally give and receive business cards! Engraved with name and title, this card holder is sure to impress. 6. Engraved Bookends – Help to organize their textbooks and manuals with these classic jade glass bookends. Adorned with the medical symbol, this set is distinguishing and perfect for the office or home office. 7. Tealight Candle Holder – Thank your doctor in this unique way with this special tea light candle holder. Engraved with their name and a special message of gratitude, this tealight is sure to be kept lit for years to come. This classic design matches any office or home decor! 8. Keepsake Box – This classic keepsake box make the perfect gift for the distinguished doctor. Engraved with their name and title and adorned with the medical caduceus, this is truly a gift any doctor will appreciate. Perfect to keep small items like wallet, keys and cellphones safe during their shifts or to adorn their office desk. 9. Christmas Ornament – A great gift for the family doctor or practitioner. Their name and title engraved into a heart adorned with medical motifs like clipboards, syringes and kits, this is the perfect gift for any doctor to celebrate year-round! 10. Personalized Clock – A distinguishing gift for an exceptional doctor is this engraved book clock! This book clock is sure to be displayed prominently in the office and treasured for years to come.